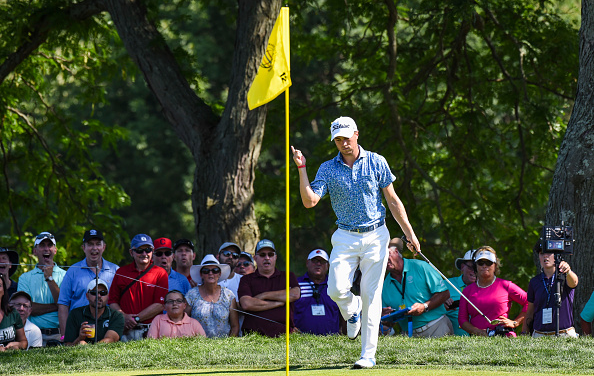 In the third round of the WGC-Bridgestone Invitational, Justin Thomas missed the green on the par-3 12th hole at Firestone, but the 25-year old American still made birdie, chipping in for one of his six gains on the day. JT signed for a 67 on Saturday to reach 14-under par. He will take a three-shot lead into Sunday’s finale in Akron, Ohio. According to Dottie Pepper of CBS, Thomas “dumps this thing on the green with a little over-spin”… to produce “your highlight of the day,” says Jim Nantz. In this six-photo slideshow (swipe/hover right to navigate) Thomas is captured hitting the ball, walking it in and celebrating. For more content like this, visit the PGA TOUR’s Instagram page.